Bowflex is known for their high quality home gym equipment. Two of their popular products are Bowflex Xceed and Bowflex PR1000. Both comes with great features and capabilities to help you build your muscles. If you plan on purchasing a home gym equipment you may want consider them both. Bowflex Xceed is a home gym equipment that was manufactured by the same company, but the marketing distribution is handled by Nautilus, Inc. This company is well known among people who like fitness. This training equipment is designed for those who wish to train their muscle with serious strength training. Bowflex Xceed is suitable for people with little time to spare to go to gym or those who prefer doing their training at home. You can train by yourself or ask your partner to train with you and get healthy together as well as making your training moment more enjoyable. Bowflex Xceed is very compact, so even though you don’t have much space to spare in your home, you still able to store it without making your house or apartment look too crowded. The equipment is measuring at 4’10” x 4’1”, but you have to spare workout area for about 8” x 6’5”, so it is perfect for those with smaller home or apartment or people who don’t want to dedicate a room just to store fitness equipment. Bowflex Xceed comes with 210 lbs. of resistance, but you may upgrade it until 310 and 410 lbs. by purchasing additional rod. So, you can see that the equipment is not only suitable for beginner but also for people with more experience or higher fitness level. Bowflex Xceed has been released years ago, but it still one of the best strength training equipment for home use today. 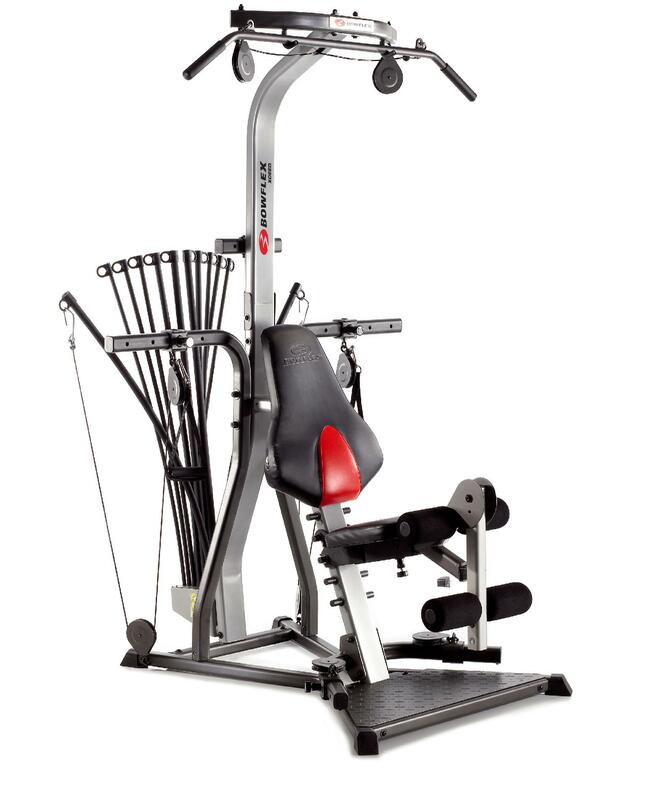 Taken from Sears, Bowflex Xceed comes with Lat Tower, Squat Station, Leg Attachment, adjustable pulley system, and Lumbar support. 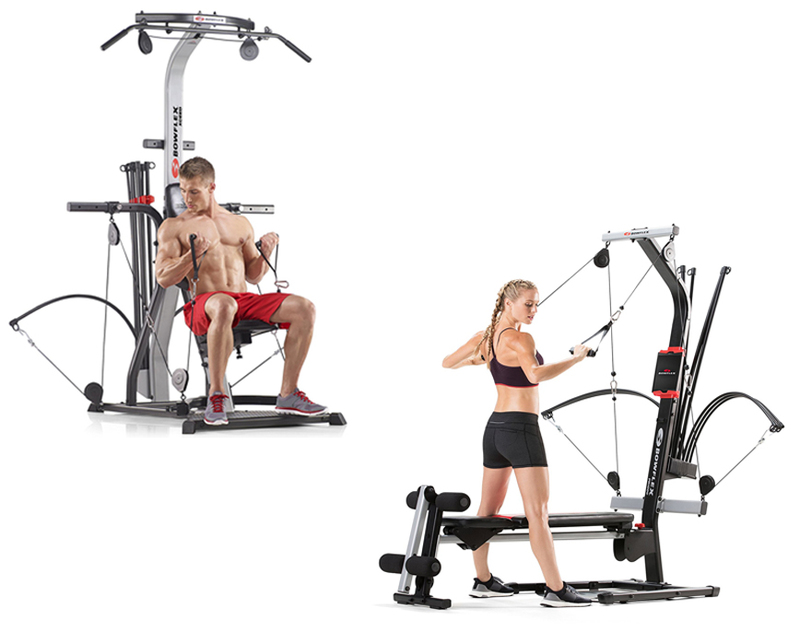 With the Xtreme SE technology, you can perform more than 65 gym quality exercises with only one fitness equipment. With its angled lat tower, you will be able to build back and shoulder faster with its integrated power. You can use the upper and lower pulley or squat station to do squats and build your glutes, quads and hamstrings. The leg extension or leg curl attachment is useful to help you develop strong and muscular legs. It also have abdominal crunch attachment with harness and multicolor bench with lumbar support. The seat is vertical in gym style with adjustable and quick release system and polyurethane high density foam cushion. To make the equipment more stable, it uses an X shaped base legs. It also comes with triple function hand grip or ankle cuffs as well as multiple cable or pulley positions for custom workouts. There are few things you need to take note to before owning Bowflex Xceed, such as if you have kids, make sure to keep your children from the equipment, since it is pretty dangerous for them and to avoid unwanted things. The equipment is not recommended to be used by people under 14 y/o. the last is if your weight is above 136 kg, you may want to change your option, since Bowflex Xceed won’t be suitable for you. If you are interested on other Bowflex Home Gym, you may want to read our article on Bowflex Xceed vs Blaze. Bowflex PR1000 is a home gym equipment for those who wish a healthier life and those who loves to challenge every muscle in their body. 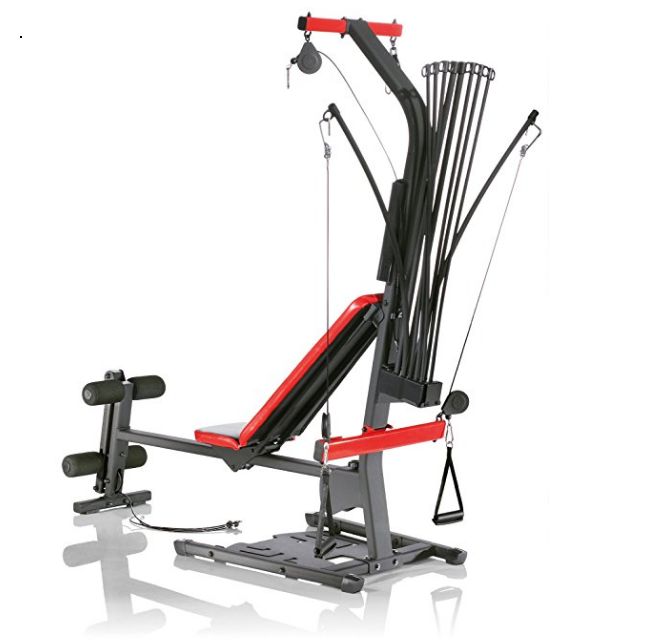 This fitness equipment is manufactured by Bowflex Company, which name always relate to great quality home gym equipment. Bowflex PR1000 power rod resistance system will provide you with consistent tension throughout your entire exercise movement. When the technology was first release many people are skeptical about it, since rather than the traditional iron weight plates, they use the rod resistance instead to provide weight for their home gym equipment. Even though it was doubted by many people at first, now the technology have come far away and has been proven to be more effective than traditional weights. The complete measurement of Bowflex PR1000 are 84” in length, 38” in width, and 81” in height, but you will need at least 103” x 80” x 82” workout area to place the unit, since the rod will need some space when use. This space is not too wide or too small, so or those with smaller house and apartments still can use Bowflex PR1000. The home gym fitness equipment is perfect for people who want to build their muscle but don’t have much time to spare to go to gym. With Bowflex PR1000, you can do your routine from home. Bowflex PR1000 comes with 210 lbs. of resistance and unlike the Xceed we have talked above, this equipment doesn’t support additional weight. This is an issue for Bowflex PR1000, since it will be good enough for beginners, but it won’t be sufficient for those with higher fitness level. The equipment is able to let you perform more than 26 gym quality exercises to build your body including toning and sculpting your upper body and lower body as well as abdominal muscles. With the folding option, you can easily store your equipment when not in use, so it will not consume too much space in your house or apartment. The multi use handgrip or ankle cuffs and 4-inch upholstered roller cushions and horizontal bench press is very useful to let you custom your routines. Before purchasing Bowflex PR1000, there are things you need to pay attention to. If you have children, make sure to monitor them closely when near the equipment to avoid unwanted things. Before using the equipment it is recommended to examine the unit first for loose part or a signs of wear. People with body weight more than 136 kg is not advice to use the machine. Now, let’s compare Bowflex Xceed with Bowflex PR1000. First is the amount of exercises you can do with each equipment, Bowflex Xceed is able to perform more than 65 exercise, while Bowflex PR1000 only have 26 exercises. Second is the ability to upgrade the weight resistance, Bowflex Xceed is able to be upgraded until 410 lbs. while Bowflex PR1000 is not upgradeable. All in all, the decision is all yours to make. Both are great choice for home gym equipment, however, in our opinion, the BowflexXceed is better since it is suitable for both beginner and people with higher fitness level.